(AP) SACRAMENTO, Calif. - California lawmakers approved billions of dollars Friday in construction financing for the initial segment of the nation's first dedicated high-speed rail line connecting Los Angeles and San Francisco. "No economy can grow faster than its transportation network allows," U.S. Transportation Secretary Ray LaHood said in a statement applauding the legislative vote. "With highways between California cities congested and airspace at a premium, Californians desperately need an alternative." Brown pushed for the massive infrastructure project to accommodate expected growth in the nation's most populous state, which now has 37 million people. He said the project is sorely needed to create jobs in a region with higher-than-average unemployment. Members of the state Senate voted 21-16 along party lines after intense lobbying by Brown, Democratic leaders and labor groups. The bill, which passed the state Assembly on Thursday, now heads to Brown for his signature. "The Legislature took bold action today that gets Californians back to work and puts California out in front once again," Brown said in a statement. 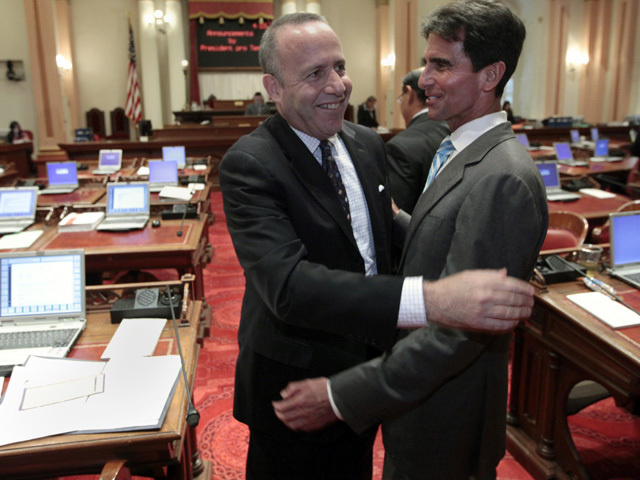 The governor celebrated with Senate President Pro Tem Darrell Steinberg of Sacramento, a fellow Democrat, in the lawmaker's office right after the vote. Republicans blasted the Senate decision, citing the state's ongoing budget problems. "It's unfortunate that the majority would rather spend billions of dollars that we don't have for a train to nowhere than keep schools open and harmless from budget cuts," Sen. Tom Harman, R-Huntington Beach, said in a statement. Sen. Ted Gaines, R-Granite Bay, said the project would push California over a fiscal cliff. "It will require endless subsidies and will blast a massive hole into our budget," Gaines said in a statement. "This is a courageous step forward for California's future," said its president and CEO, Jim Wunderman. In recent days, Democratic leaders included more funding to improve existing rail systems in an effort to entice support for the bullet train. The bill now allocates a total of $1.9 billion in bonds for regional rail improvements in Northern and Southern California. The upgrades include electrifying Caltrain, a San Jose-San Francisco commuter line, and improving Metrolink commuter lines in Southern California. Dan Richard, chairman of the California High-Speed Rail Authority, which is managing the project, said California would have lost billions of dollars in federal aid if the Senate fails to pass the bill before adjourning Friday for a monthlong recess. California entered a contract that called for the federal government to provide money for building the Central Valley segment if the state also put up its share, he said. "Not only will California be the first state in the nation to build a high-speed rail system to connect our urban centers, we will also modernize and improve rail systems at the local and regional level," Richard said. Steinberg, the Senate leader, said the vote signaled the "biggest, boldest public works project in decades in California." He likened it to the state water project that was first undertaken by Brown's father, Gov. Pat Brown, in the late 1950s. The massive network of dams, reservoirs and canals is still used today. The bill approved Friday authorizes the state to sell a portion of a $10 billion high-speed rail bond that voters approved in 2008 under Proposition 1A. The bond passed with 53 percent support, but a recent Field Poll showed support for Brown's November proposal to temporarily raise state sales and income taxes could slip considerably if lawmakers approved funding for high-speed rail.